What occurs to me now I have time to think. 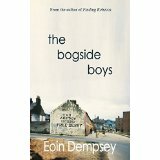 A couple of days ago I downloaded an ebook called, “The Bogside Boys” by Eoin Dempsey. I don’t usually read books about wars and fighting but it was free at the time and I’m glad I did. Apart from being a good book to read it has reminded me of 1972. The only reason I remember the exact year is that the book mentions, “Operation Motorman” an event which had great significance for many Irish and some for Alex and me. After about 3 months holiday in France, Portugal and Spain we left Rota where we’d stayed trying to eke out our money. My last diary entry was that day, the 10th of July so I’m not sure exactly when we were heading back up the M6 to Scotland. We were hitch-hiking and our last ride was heading to Liverpool so they left us just off the motorway. It was getting late and we decided the best thing to do was to stop hitching for the day and find a place to sleep. There was a nice thick hedge lining the road and we were able to get deep into it which was just as well considering what happened. We were sound asleep until we were woken by a phenomenal rumbling noise which came closer and closer until it stopped right opposite our sleeping spot. Neither of us moved but we could see big wheels and legs and then heard the unmistakable sound of someone peeing into the hedge. Eventually the rumbling started again, the convoy moved off and we went back to sleep. Just before dawn I was woken by the sound of rustling close to my head, opening my eyes I gradually made out the shape of a hedgehog snuffling its way along. Over the years the memory I’ve recalled most often isn’t of the soldiers on their way to Ireland as part of “Operation Motorman” but the little hedgehog just going about its business. This photo reminds me of all the breakdowns I had in “The Yellow Peril” and how Dad came to my rescue every time even though I was living and working about 3 hours away. Dad was an aircraft mechanic in the war and had a knack with motors. If parts couldn’t be obtained he’d usually be able to make them. When I was in a position to buy my first car I trusted Dad to find me the right one. I really wanted a Triumph Herald but he convinced me that they had too many problems with rust so I decided I’d have a Morris Minor instead. I thought they were cute. I was excited when Dad phoned to tell me he’d bought my car but devastated when I saw it. 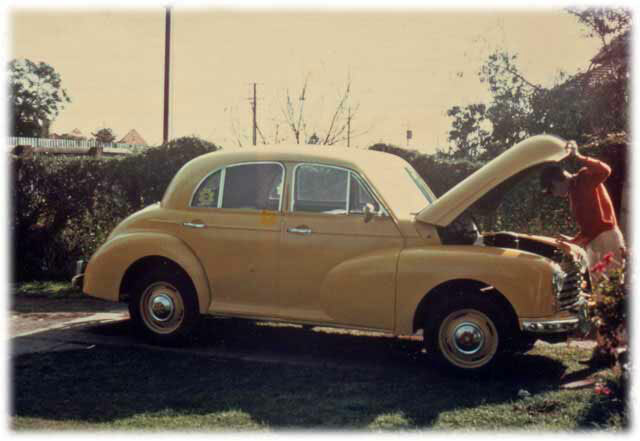 It was a Morris Oxford, next size up from the Minor, the paint was maroon and oxidised. Horrible.I didn’t drive it back but asked Dad to paint it bright yellow for me and apparently he shut his eyes as he applied the first brush stroke. He did an excellent job, you couldn’t even see paint strokes on it and I put happy, bright, daisy stickers on the hubcaps. There was no heater in it so in winter when I set off to go back to Berri after a weekend in Adelaide I wrapped a blanket around myself and had a hot water bottle in my lap. Throughout the 3 years I had the car I can remember breaking down on the way into Waikerie, Renmark, Barmera and Truro. Every time I came back to Adelaide the car boiled going up the long, long incline of Accomodation Hill. I’d stop at the top and let the car cool down before continuing. Once when I was stopped there I was bombarded by black beetles. I’m older and wiser now, I think. I live in Adelaide, South Australia a city of just over 1 million people. People often say it’s so small if you go into the city centre you’re bound to bump into someone you know. The city centre is 1 square mile bordered by parklands on all sides. Our state “leaders” seem intent on trying to make Adelaide like Sydney or Melbourne but I think that’s a big mistake, small places have their own appeal. I like Adelaide because it’s small for a city, you can travel from one side to the other in about an hour, it’s half an hour west to the beach and the same east to the hills. It suits me, it’s my town. You can see a larger photo if you click on an image. Belair National Park 30 mins drive or 25 mins train ride from the city. New footbridge over the River Torrens. Brighton Beach, 30 mins from city centre by car. Hindmarsh Square, one of 5 squares within the city square mile. Rundle Mall, a meeting place for everyone. Old architecture in Rundle Mall. The Beehive Corner, a place people used to arrange to meet before mobile phones. Victoria Square fountain acknowledges the traditional owners of the place. City housing complex for homeless people. A meeting of cultures, Rundle Mall. Our place, 30 mins drive or 25 mins on the train from the city. Where else but Rundle Mall? “The Cheese Grater”, or the Science and Medical Research Centre.